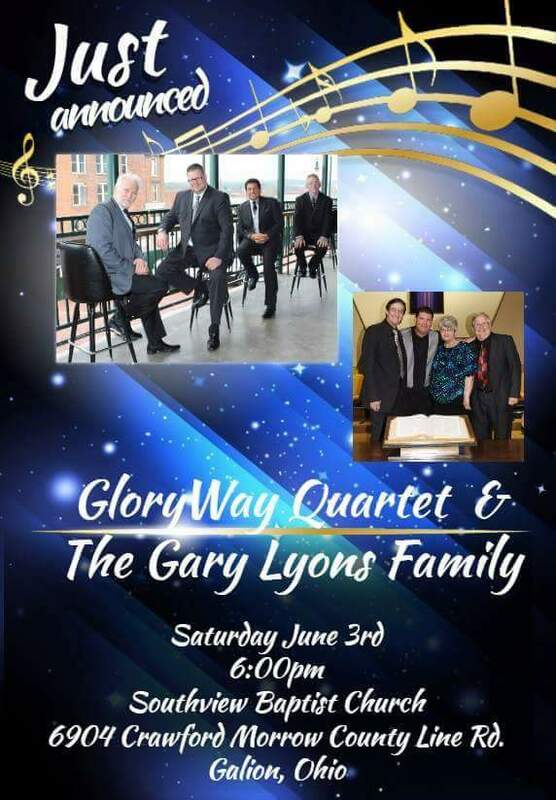 GALION — Gospel Singing group Glory Way Quartet and The Lyon’s Family will be in concert at Southview Baptist Church, 6904 Crawford-Morrow County Line on Saturday, June 3, at 6 p.m. Glory Way is from the Mansfield area. The Lyons’ Family, of Marion, also will sing. The public is invited to attend and enjoy the wonderful music. There is no admission charge, but a love offering will be received. Refreshments will be served in the Fellowship Hall following the concert. Come and bring a friend.